The divisions in the Labour Party are becoming uncontainable. The decision of seven Labour MPs on 18 February to split and set up The Independent Group (TIG) marks a new stage in the struggle of the dominant right wing of the Parliamentary Labour Party (PLP) to remove Jeremy Corbyn as Labour leader. Corbyn himself has shown that he will not stand up to these attacks: maintaining the unity of the Labour Party has been his justification for a series of concessions to his political enemies. This, however, has not stemmed the attacks. Jackie Walker’s expulsion on 27 March follows the suspension of left-wing MP Chris Williamson, a prominent Corbyn supporter, for alleged anti-Semitism, all part of a strategy to intimidate anyone expressing even mild support for the Palestinian people. Such support is now routinely claimed to be in breach of the International Holocaust Remembrance Association (IHRA) definition of anti-Semitism. Behind this lies an equally serious intent – to create a hostile environment within Labour for anyone with the slightest anti-capitalist sentiment. Robert Clough reports. In 18 months, 796 rough sleepers have died on the streets of Britain, 15 of them in Manchester. Since 2010 rough sleeping has risen by 169% nationally. In Manchester, the Labour council’s response has been to propose a Public Space Protection Order (PSPO) based on section 59 of the Anti-Social Behaviour, Crime and Policing Act 2014, an act used specifically to shut down protest, regulate behaviour and restrict access to public spaces. Manchester proposes a three-year order covering the whole of the city centre. This follows neighbouring Salford’s Labour council, which has six PSPOs in place already, including a ludicrous ban on swearing around the luxury developments of Salford Quays. Manchester argues that its proposals, which include criminalising ‘aggressive or intimidating begging’, failure to move from a building entrance when asked to do and erecting a tent, are ‘necessary and proportionate’. 1 March 2019: The Labour Party is once again in the midst of a self-generated crisis. In the past two weeks, eight MPs have split from it to form the Independent Group of MPs, citing the leadership's failure to back a second referendum on Brexit, and Corbyn's handling of anti-Semitism allegations. On 25 February the Labour leadership announced it would put forward or support an amendment in favour of a second referendum. Two days later, Labour MP for Derby North Chris Williamson was suspended for alleged anti-Semitism after announcing he would show a documentary in the House of Commons about the witchhunt of Jackie Walker for her alleged anti-Semitism. 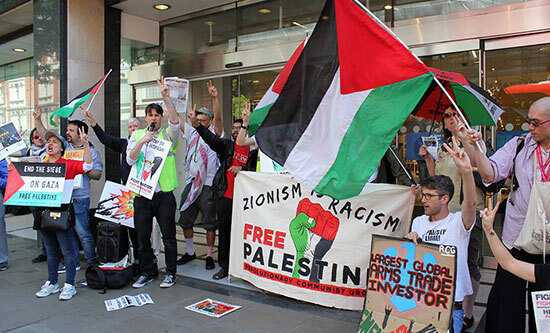 In a further example of its capitulation to the right-wing Parliamentary Labour Party, Corbyn’s leadership team has failed to defend Williamson for his real ‘crime’ – condemning the racism of the Israeli state. Robert Clough's article from FRFI 253, October/November 2016 reported on Corbyn’s inevitable concessions that started early in his leadership as he tried to hold the Labour Party together. We republish that article below. With the Tory government on the ropes over Brexit, the Labour Party conference had to show it would be a safe pair of hands, to manage the affairs of British imperialism if it wins the next general election. Crucially this required a coherent and unified position on Brexit which would meet the needs of the ruling class. But it required more: given the furore over allegations of anti-Semitism within the Labour Party, there needed to be reassurance that support for the Israeli state would be maintained, there would be no move to the left and that the most nakedly pro-capitalist wing of the party would not be sidelined. The conference was a deeply reactionary affair which Corbyn’s radical rhetoric at the end could not disguise. ROBERT CLOUGH reports. Ken Livingstone’s resignation from the Labour Party on 21 May, following a two-year suspension for alleged anti-Semitic comments, is a victory for the Party’s reactionary, pro-Zionist wing. His supposed crime had been to point out that the German Zionist leadership had sought to collaborate with the Nazi state for a period of time in its early years. However, historical truth is anathema to pro-Zionist Labour politicians; they are determined both to undermine Jeremy Corbyn’s leadership and to drive pro-Palestinian sentiment out of the Labour Party. In a campaign over the last two years they have constantly claimed that the left is riddled with anti-Semitism. Instead of standing against this, the Labour left has chosen to retreat. Livingstone’s decision to throw in the towel is just the latest example of its cowardice. Robert Clough reports. Starting on 22 February 2018, 61 universities across Britain have seen lecturers, researchers, teaching assistants and support staff strike over proposals to end guaranteed pensions. These proposals come from the national body of university vice chancellors, Universities UK (UUK). Prior to the strikes no sincere negotiation had been offered. Since the industrial action began university campuses have become divided. Individual vice chancellors have broken ranks with the UUK position. Students have overwhelmingly supported staff: standing on picket lines, occupying campus buildings and petitioning vice chancellors. The University and College Union (UCU) is also divided: its national leadership reached an agreement with UUK that would have sold out the strike. A rank and file rebellion rejected the leadership’s capitulation and voted to continue the strike. As we go to press, UUK has made a further offer of negotiations and postponed any changes until April 2019; UCU branches will vote on the proposals on 28 March. In February 120 women in Yarls Wood Immigration Removal Centre went on indefinite hunger strike, the latest in a long list of acts of resistance from within Britain’s racist immigration prisons. The strikers launched a set of demands that included: an end to indefinite detention; amnesty for everybody who has been living in the UK for over 10 years; an end to the employment of detainees to carry out menial tasks within detention centre for £1 an hour; ‘an end to charter flights and the snatching of people from their beds in the night and herding them like animals’. (The full list of demands is available at: https://detainedvoices.com/2018/02/25/the-strikers-demands/) Labour’s Shadow Home Secretary Diane Abbott and Shadow Attorney General Shami Chakrabarti were given permission by the Home Office to meet with some of the striking women. They expressed their solidarity. Yet in practice Labour is putting forward its own racist plans for how they would run the racist British state. Karl Marx died on 14 March 1883. One hundred years later the socialist revolution has yet to take place in any of the major industrial (imperialist) nations where it was expected to occur first. Instead of breaking out in the industrially developed capitalist countries of England, America, France, and Germany, the socialist revolution occurred first in backward Russia. And since that time all successful social revolutions have been carried out in the less industrially developed parts of the world and in the oppressed nations. However, far from contradicting the fundamental principles of the founders of Marxism, such developments were anticipated in their writings and the principles were laid down for explaining them. Bin workers in Birmingham have been fighting for their livelihoods against a Labour council that is using every trick in the book to enforce major cuts to services and a union, Unite, that is happy to yield to the party it supports. Joe Smith reports. The National Union of Rail, Maritime and Transport workers (RMT) called on their members to stage a 48-hour walkout in early November in protest against Southern Rail’s plan to abolish the railway guard on all their trains across Surrey and Sussex, making them ‘Driver only’. This is in spite of the Government and Southern’s parent company, Govia Thameslink Railway (GTR), both promising passengers that they will keep this vital second person on trains. They claim that abolishing the guard – which would result in 400 workers losing their jobs - is necessary, because it would cut costs and new developments in technology would help to increase safety standards. On Tuesday 14 November, the Central Arbitration Committee (CAC) ruled in favour of the app-based food delivery company Deliveroo in a landmark tribunal case concerning basic worker rights and protections. The decision comes after a year-long struggle waged by the company’s riders – organised by the Independent Workers Union of Great Britain (IWGB) and supported centrally by comrades of the RCG – in a bid to secure a change in their employment status from that of ‘self-employed contractor’ to ‘worker’. Under the status of ‘self-employed contractors’, Deliveroo riders are not entitled to basic rights and protections, including holiday pay, sick pay or even the right to the national minimum wage. Perhaps most significantly, they lack the right to official union representation with which to negotiate pay and conditions with their employer. This re-branding of casualised labour is the standard practice of many companies within the so-called ‘gig economy’. Labour Party conference - Will Corbyn take on Labour councils? With rising assurance that Labour will win any snap general election called by Theresa May’s beleaguered government, Jeremy Corbyn’s speech at the Labour Party conference on 27 September was designed to enthuse the layer of young professionals who were key to his election as Labour Party leader. Confident promises on housing, investment, employment and foreign policy were in marked contrast to his evasiveness in an interview with Andrew Marr on BBC the previous Sunday. Corbyn has to perform a balancing act: he needs to keep the support of better-off sections of the working class so that they campaign for Labour in the event of a general election, while reassuring the ruling class that a government he leads will be a safe pair of hands defending British imperialist interests. The most significant part of his speech dealt with the housing crisis; his proposals, including ballots over regeneration plans, are a challenge to Labour-run councils. The question is: will he follow through? Robert Clough reports. Laura Pidcock: working class hero? On 11 August the new MP for North-West Durham, Laura Pidcock, made headlines for saying that she could never be friends with a Tory. In an effort to placate Labour right-wingers who had told her to ‘grow up’, she later added that she ‘would work with a Tory if it is going to benefit the people in my constituency’ but reiterated her ‘disgust for people who are ambivalent to the suffering of my constituents’. If only she had felt so strongly when, as a councillor in February 2017, she voted in favour of £6m worth of cuts to the 2017/18 budget for Northumberland County Council and a further £36m of cuts for 2017-20. Due to economic growth, £10m has come off that figure. Nevertheless budgets for fire services, social care and education will all be affected. In the council's minutes from 22 February, Pidcock is recorded as stating her concern that the public would feel that the cuts were too deep. Her primary worry was that Labour could lose votes. Chancellor Philip Hammond’s dismissal of public sector workers as ‘overpaid’ in response to Foreign Secretary Boris Johnson’s proposal to lift the pay cap. In conditions of deepening economic crisis, which Brexit and parliamentary chaos will only worsen, the ruling class may need to act, and it is now more likely to accept the alternative of a Corbyn-led Labour government. Robert Clough reports. On 11 July the government published the Taylor review into modern working practices. Matthew Taylor had promised ‘to tell Theresa May what’s wrong’ with the fast-growing ‘gig economy’, but unsurprisingly – given that he is a former adviser to Tony Blair’s Labour government – the report does not seriously address the lack of rights, insecurity and low pay that comes with casualised labour. Taylor said he would find the answers ‘to make zero-hours flexibility or self-employment work for ordinary people’. His major proposal is the creation of a new employment status called ‘dependent contractor’, an intermediary status between ‘employee’ and ‘worker’, covering casual, independent relationships with a limited set of key employment rights applying, such as holiday and sick pay. On 23 May Deliveroo riders fighting for union recognition and basic workers’ rights crowded into a packed courtroom before the Central Arbitration Committee (CAC). Deliveroo riders and the Independent Workers of Great Britain union (IWGB) are fighting to gain a collective bargaining agreement. If they succeed, Deliveroo will be forced to negotiate pay and conditions for their riders with the IWGB. Deliveroo argues that its riders are ‘self-employed independent contractors’ – and therefore not eligible for most employment rights. Collective bargaining rights in Britain are only granted to ‘workers’ (like self-employment but with core workers’ rights – usually casual or agency workers) and ‘employees’ (with full employment rights). Therefore the CAC has to decide whether Deliveroo riders are ‘workers’ or ‘self-employed independent contractors’. As ‘workers’, Deliveroo riders would receive the right to the minimum wage, paid holidays and protection against discrimination. Deliveroo has saved millions by limiting rights for its workers, which explains why Deliveroo and its team of eight lawyers at the CAC are so opposed to this collective bargaining agreement. In the run-up to the general election, comrades from East London RCG and Focus E15 campaigners took the opportunity of exposing the shocking record of Newham Labour council on housing, and its embroilment in a raft of financial scandals. We attended the Annual Council Meeting on 14 May to heckle Labour Mayor Robin Wales as he boasted that over the last 25 years he had brought Newham from an ‘incompetent backwater’ to a place where there are ‘real Labour values that create for each of us the means to realise our true potential’. He boasted that Newham is ‘showing the way for others to follow’. Yet behind the shiny towers of luxury accommodation, the swathes of shopping outlets and the new cultural ‘mega-hub’, the reality for Newham’s working class is grim: the second-highest poverty rate in London, the second-highest proportion of homeless residents in the country and more people living in slum-like temporary accommodation than ever before. Meanwhile, council housing estates like the Carpenters Estate remain largely boarded up, facing demolition and replacement by unaffordable private flats. Victory to the LSE cleaners! Striking cleaners at the London School of Economics (LSE) – all from migrant or minority backgrounds – have won a significant victory in a fight to improve their terms and conditions. Like most universities, LSE outsourced cleaning services years ago to save costs for its multimillion-pound budget; cleaners could be employed with worse terms and conditions than in-house staff, who are entitled to up to 41 days’ paid leave, six months’ full sick pay, and good maternity pay and pension rights. Outsourced cleaners, in this case with the company Noonan, are only entitled to the statutory minimum. That means no pay for the first three days off sick, and then just £17.87 a day. For a cleaner paid £9.75 an hour in London, that is untenable. Jeremy Corbyn’s record as an anti-imperialist has been sacrificed to his priority of maintaining the unity of the Labour Party. Since becoming leader, Corbyn has conceded to its reactionary members: allowing MPs free votes on bombing Syria and renewing Trident nuclear missiles; succumbing to the Israeli embassy and Zionist campaign to brand support for Palestine as anti-Semitic. In 2003, 254 Labour MPs voted for the invasion of Iraq, 84 voted against and 69 abstained. This was a defining moment in British politics when the Labour government disregarded public opposition to pursue an illegal and bloody war. Responding to the July 2016 Chilcot report into the war, Corbyn said the Labour Party had been misled by a ‘small number of leading figures in the government’ who were ‘none too scrupulous’ about how they had made the case for war. An offended backbench Labour MP shouted ‘Sit down and shut up, you’re a disgrace.’ His was the voice of many of the 254. The ascendency of Labour left veteran Jeremy Corbyn from backbench rebel to unlikely leader has raised the question as to whether socialists should support Labour in the General Election on 8 June. The fact remains that the vast majority of Labour MPs are right-wing reactionaries opposed to Corbyn, who has made a series of concessions to sustain the unity of the party above all else. As our Don't vote - fight for socialism! General Election statement explains, he has sacrificed his anti-imperialist and anti-Zionist principles. He has also authorised Labour councils to implement devastating cuts to local services. Corbyn has ensured that Labour remains a racist, pro-austerity, imperialist and warmongering party. Following the local elections on 4 May, Labour leader Jeremy Corbyn stated: ‘Labour councils and Labour mayors are putting families and pensioners first. Those who need help most can rely on us.’ This was a lie: Corbyn was covering up for the Labour councils which have slashed services and jobs while refusing to lead a fight against austerity. Labour bears responsibility for the devastation of local services all over Britain. Between 2010 and 2015, central government funding to local authorities was cut by 37% in real terms and by 2020 the only sources of council income will be council tax and local business rates. On 9 May, Labour leader Jeremy Corbyn pledged to put housing at the forefront of his party’s general election campaign, guaranteeing to build a million homes, with half of them council houses. But in the Labour manifesto this radical promise has been watered down to ‘at least 100,000 council and housing association homes a year’ – by the end of the parliamentary term – ‘for genuinely affordable rent or sale’. Corbyn has embraced Labour’s new definition of ‘council’ housing, which can be any kind of tenure and where the idea of a regulated council rent is a thing of the past, with ‘affordable’ meaning anything up to 80% of market rent. There is no mention of social rent. The last government’s Housing and Planning Act ushered in a massive fire-sale of public land and housing stock, fuelled by the City of London, giant construction companies, international developers and estate agents eager to profit from soaring land prices. But far from challenging this sustained attack on working class housing, Labour councils have leapt onto the gravy train. In the run-up to the general election on 8 June, socialists will have to decide whether to support the Jeremy Corbyn-led Labour Party, or to oppose it because it remains a racist, imperialist and warmongering party. The Revolutionary Communist Group is clear: we are facing a global crisis of the capitalist system that threatens humanity with war and destruction. This means that there is only one choice: we have to build a working class movement that can challenge the ruthless, predatory British ruling class. We have to fight for socialism. Corbyn and his supporters are actively preventing this development. They and the trade unions have blocked the emergence of any resistance to austerity while spreading the illusion that, in the midst of a deepening economic crisis, a future Labour government can ‘deliver a fairer, more prosperous society for the many, not just the few’. The reality is that it cannot and it will not.